In North America alone, there are more than 70 millions dogs as pets. This would be considered a cultural phenomenon, but history shows that humans have always stayed close to their most loyal companions. These millions of dogs brighten up our days and form gratifying relationships with everyone around them. Aside from an occasional bark, whimper or yawn, they don’t really articulate themselves, yet anyone who loves dogs knows that they can communicate more with their eyes, their tongues and their tails than most of us can with a pen. Sloppy Kiss Cards was inspired by the canine cultural centers of Vancouver, BC and Seattle, WA, where dogs are not only part of people’s lives, but part of their lifestyles. At home, we had the iconoclastic Bruiser, a black lab whose ruthless pursuit of oversized sticks was matched only by his aggressive attempts to secure a spot on the bed. Max came later and added an air of quiet dignity to our day to day lives, whether patiently waiting for someone to get home or politely trying to draw our attention to a sufficiently slobbered ball. His distant brother Riley showed up years later and showed himself to be more socially adept (not to mention more vain) than some of the kids. Each had their own personality and each said so much to us. Having them in our life and seeing friends with their dogs, we came to appreciate the unique way dogs can communicate a feeling. Sloppy Kiss Cards is our way of using these everyday dogisms to convey sentiments to the people who can recognize and appreciate them. Where words fail, dogs come to the rescue. 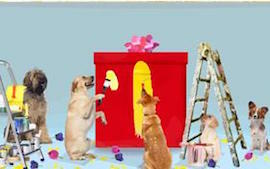 Our high quality animated ecards and greeting cards are for dog lovers on all occasions. From traditional (Happy Birthday, Get Well Soon, Thank You) to unconventional (Moving in Together, How come you don’t call?, Dog Adoption), all our ecards are clever, tasteful, and feature original music. You get to select the breed and name of the dog that stars in every ecard you send. A years worth of good wishes, salutations and little notes can be organized in one sitting thanks to helpful features like scheduling, an address book and card tracking. We’d like to think of Sloppy Kiss Cards as the post office for a global community of dog lovers. Site users are encouraged to submit pictures of their favorite pooch. From your submissions, we will pick a litter and avail them for the use of master and all the other members. As we are always searching for inspiration, we are also asking our site users to submit their own memorable dog stories. If chosen, your story could be turned into a new, original ecard available for everyone to enjoy. For less than the cost of a small bag of dog food ($9.95 a year), members of Sloppy Kiss Cards can send an unlimited number of ecards. Senders and receivers aren’t the only beneficiaries, either, as a portion of proceeds goes to the Petfinder.com Foundation, helping adoptable pets find homes.